John Pearson graduated from Peterhouse Cambridge with a double first in History, then worked on the Economist Intelligence Unit and as a BBC trainee producer before being offered a job by Ian Fleming as his assistant on the ‘Atticus’ column for the Sunday Times. James Bond: The Authorised Biography is a fictional biography of James Bond and was first published in 1973, some years after his factual biography The Life of Ian Fleming (1966). Writing autobiographically, Pearson begins the story with his own recruitment to MI6. Already, the department had assigned Ian Fleming to write novels based upon the real agent; Fleming was to be truthful about the agent’s adventures. The writing style is some of the most Fleming-esque you will find, which puts this book in the frame as a bona-fide continuation author, as it describes additional Bond missions with flare and accuracy to the character. Considering Pearson’s knowledge of Fleming, who else better to inhabit the Bond world with all the incidental knowledge of Bond and his creator. Pearson begins to search for the inspiration of the character of James Bond and begins to unearth details of an actual James Bond that knew Ian Fleming. When the Secret Intelligence Service (SIS) take an interest in the book, it is suggested that rather than trying to censor and suppress it, they could control the flow of information by cooperating. The theory being that the truth is bound to come out sooner or later, so it is better to get the facts correct from the start. Pearson ends up in Bermuda where he meets the real James Bond who tells his life story for the record. The earlier parts dealing with Bond’s childhood and ancestors are really good and begin to flesh out the character that Fleming only sparingly described. The book moves on to Bond’s life during the second world war and his introduction to the world of espionage through Fleming at naval intelligence. The book continues and links the obituary to Bond from the novel You Only Live Twice to the actual James Bond. “So this was Bond, this figure in the shadows. Until this moment I had taken it for granted that I knew him, as one does with any familiar character in what one thought was fiction. I had been picturing him as some sort of superman. The reality was different. There was something guarded and withdrawn about him. I felt that I was seeing an intriguing, unfamiliar face half-hidden by an image I could not forget. 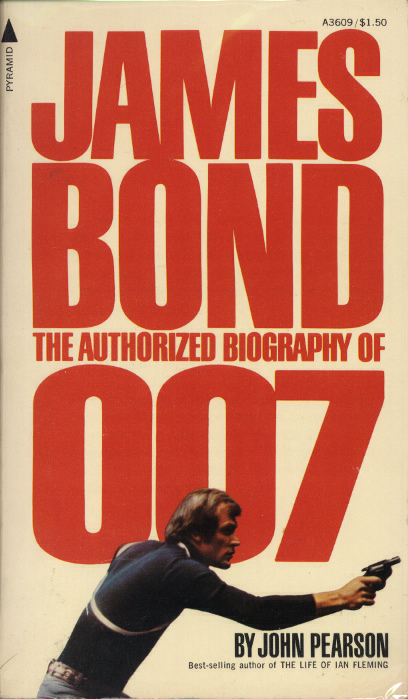 The U.K. dust jacket is notable in that it is the only original novel to succeed in using Eon’s 007 logo on its first edition (Eon would object to the use of the 007 logo on the U.K. paperback edition of John Gardner’s License Renewed, forcing a redesign). James Bond: The Authorized Biography of 007 was most recently reprinted in hardcover in 2007 and paperback in 2008. These editions used the shortened UK title, James Bond The Authorized Biography. John Pearson is the author of several novels and biographies including The Life of Ian Fleming, Stags and Serpents: the History of the Dukes of Devonshire andThe Profession of Violence: the Rise and Fall of the Kray Twins, which was awarded the Edgar Allan Poe Special Award by the Mystery Writers of America.